I’ve become kind of ‘known’ for my soup. If you’ve been invited to my home, attended a workshop, a dinner meeting, chances are as you walk through the door, you’ve had soup thrust upon you. In fact my soup has become so legendary that at one speaking engagement the wonderful woman who introduced me waxed poetically about my soup – which was perhaps the most flattering personal endorsement I have ever received. What is it about soup? Quite a bit of thought-full-ness goes into each bowl. I search through the cupboards and fridge to suss out ingredients, assemble a collection on the counter then mull over the soup possibilities. Next I wash, chop, dice and mix. Toss everything into a pot and begin to stir. Simmer, stir some more, taste, add herbs and spices, stir again, then serve. The recipes are equal parts chance, luck and experience plus one secret ingredient – they are each made with LOVE. Trust me, it makes all the difference. 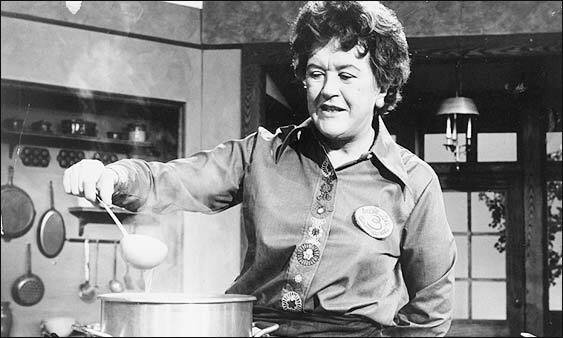 This is Julia Childs, not me, making soup – just in case there was any confusion. Preparing soup is as much an exercise in zen living for me as it is a gesture of welcome friendship for those I am making it. The best soup cannot be rushed. The flavours need time to mingle, the vegetables have to soften, the broth must come to a gentle boil. When I am making soup, time slows down. And when we sit to eat it the slurping and sipping, smacking of lips makes it a shared experience. You can’t gracefully eat soup on the run. In life, it’s true that nurturing takes time, with ourselves, our relationships as we mingle, soften and boil into the flavour-full people we are meant to be. February 2006 my work was featured in O, the Oprah Magazine. Once you have been introduced to the Oprah family you carry a kinship with their ongoing conversation on what it means to live a deep meaning-full life. Since then, I’ve been peeking over the fence of the OWN empire as they happily picnic the ‘it’s always summer at Oprah‘s’ days away, lounging elegantly in Oprah‘s backyard luxuriously tossing ideas around like balloons, wondering what can I bring to this conversation? I have realized that my unique weapon, full of my secret ingredient, is my soup.